Near The Fast Water…is a collection of stories about native birds and other inhabitants of the Northern California Delta. Cold tule fog rises from the slough water as the early morning sun warms the Delta. Poppa Barn Swallow perches on a dock railing to preen. Then he sings his morning song. With breathtaking speed, swooping and turning he flies around the boats and docks to catch a breakfast of live mosquitoes. After eating many mosquitoes, he catches another to bring to momma Barn Swallow as he returns to mind their nest. Momma Barn Swallow kept her seven tiny eggs warm in the nest all night. She laid the first egg 18 days ago in the well built and tidy, down-feather lined mud nest. She sings and happily eats the bug Poppa Barn Swallow, tidies up the nest and perches on a railing to stretch. Poppa Barn Swallow adds more down feathers while he checks each egg, adjusting his feathers to warm them, and settles into the nest. Momma Barn Swallow flies off calling “sweet-weeet, sweet-weeet, sweet-weeet". She swoops to catch mosquitoes for breakfast. Then swooping one inch over the slough water, she scoops a drink of water, and perches to clean and preen her feathers. Poppa sits on the eggs in the nest, one egg stirs. It is ready to hatch! The chick eventually chips a hole in the shell with its beak. Poppa Barn Swallow calls “sweet-weeet”. Momma Barn Swallow flies straight back to the nest. In a while the hatchling emerges from its shell. Momma and Poppa quickly remove shell pieces from the nest and preen the hatchling. In a few hours the hatchlings natal down-feathers are dry and the gape on his beak is a bright yellow. Tiny peeps are the first sounds the hatchling makes. The hatchling chirps, peeping a bit louder and more chirps! This hatchling has begun to chatter! So his name is Chatter. Poppa Barn Swallow brings a mosquito for Chatter, who eagerly gulps his first breakfast. Chirping contently he settles back for a nap in the warm, cozy mud nest. The late afternoon turns to evening, momma & poppa Barn Swallow watch the bright sunset colors changing on the Delta. The Swallow family settles in for the night. This illustration may be printed by the reader to color in, see color plates and photos in Delta Birds Coloring Book web page. 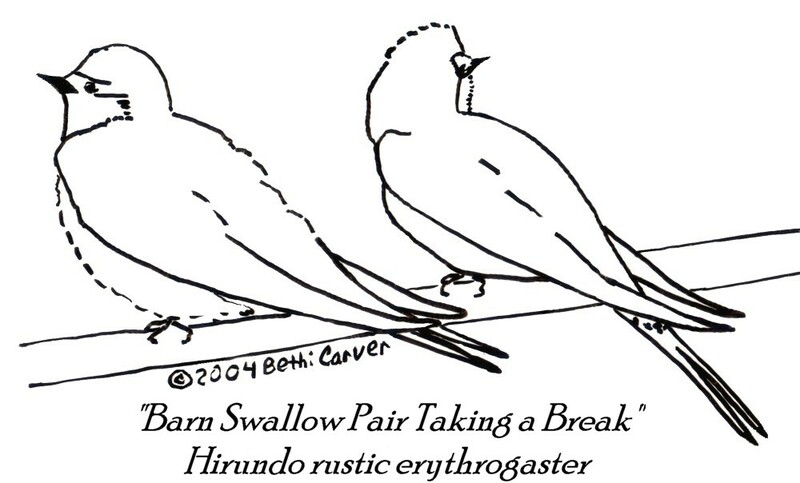 What do Barn Swallows primarily eat? What is the Barn Swallow scientific name? How many eggs were in the nest? How long does it take for a Barn Swallow egg to hatch? What is a newly hatched bird called? What part of the beak has what color on it? How can people co-habit the docks with the wild birds? Once upon a time there was a Great Blue Heron named Baby Blue. Not a year old, weighing 4 pounds, 6 foot tall and the same wing span, he had a one foot long beak. An awkward bird with scraggly, broken gray feathers, he crashed into a boat or dock when landing! Baby Blue lived with his parents and sibling. In the early morning they caught fish, frogs, crawdads, small birds and mice in the shallow water along the levee rocks and in the green island pastures. He spent warm summer afternoons playing, fishing and napping. While spending time on his own on the docks, people on the boats threw him fish. Sometimes he stole a fish off a fishing line! Luckily, he didn’t eat a fish hook. Summer passed, he no longer fished like a Great Blue Heron in the shallow waters or in the green island pastures. After a while Blue got so used to being fed, he did not fish much on his own. One day, he played and napped on the docks, but people were not around to throw him fish, so he did not eat all day. By evening, he was a very hungry bird, there were many fish in the deep water. He jumped right in, plop, like a duck, forgetting how to stalk smaller fish adn crawdads in the shallow waters or how to catch salamanders and mice in the green island pastures. Swimming like a duck, he caught a 6 oz. Blue Gill. He ate another, and another and was still hungry. Fishing was good! Then he caught a 3 pound striper. After struggling, he ate it whole. Now full it was time to preen and roost for the night. Lifting his great wings, he pushed them down to fly out of the water, nothing happened! He flapped repeatedly to no avail. All the fish made him to heavy to fly! He went to the dock and tried to climb out, no luck. He was water logged, cold and ate too much! Very early the next morning, a boater was walking on the dock and found Blue with his head and long beak on the dock. Exhausted from efforts to get out of the water, Blue had spent a very cold and wet night in the water and had almost perished. He was pulled out of the water. People on the dock called the Lindsay Wildlife Hospital. They instructed to put a small t-shirt over the wings to keep them closed and wram him in a warm blanket. He was going to be fine and fell off to sleep. After that he did not eat too much fish at one time and people fishing stopped feeding him. Raising his own young, fishing in the shallow waters and hunting for small reptiles and mice in the green island pastures, he is a Great Blue Heron again. Fall through Spring the Great Wading Birds, mostly Egrets and Herons, are vocal with mating dances, nest building and raising young. Adult birds are very protective, do not approach nests or young. The adult Great Blue Heron beak is 1 foot long. Fall migration on the Pacific Flyway is host to thousands of birds from hundreds of species. Some stay through winter, others return in spring. Two large birds, Great Blue Heron and Sandhill Crane are both gray. Cranes have thick bodies, red crown and large flocks are seen or heard, flying and landing. 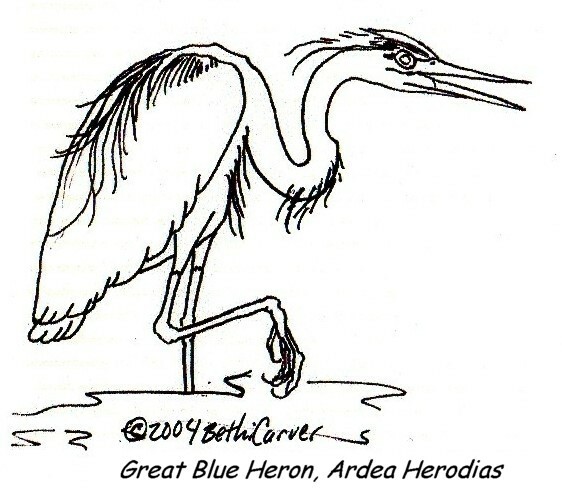 What do Great Blue Herons primarily eat? How many pounds of fish did Blue eat? How did people change the young birds behavior away from being a wild bird? What problems did this cause the wild bird? What did the people learn not to do? What is the Great Blue Heron nest made of? What is the scientific name for Great Blue Herons? How is the nest lined? How long does it take for a Great Blue Heron egg to hatch? What part of the newly hatched birds beak has what color on it? How can people co-habit the docks with these large wild birds? All artwork, text, titles and images belong to and are the property of the artist, Bethi Carver. No reproductions, copies or using in any internet or other media of any kind is allowed without the prior express written permission of the artist and owner of this website, Bethi Carver. Thank you very much. Copyright © 2010 Bethi J. Carver. All rights reserved.